The Arizona Joshua Tree Forest and Grand Wash Cliffs in northwestern Arizona have been the crossroads of many Native Americans and Emigrant cultures for over 1000 years. From A.D.600 to A.D.1200 there is evidence that several distinct cultures occupied the general vicinity of the Arizona Joshua Forest. There are at least two Patayan sites; one site contains a “Mescal pit” and another site contains a “Corrugated ware shed”, of probable Pueblo III age around A.D. 1200. These western variants of the Pueblo culture were Yuman-speaking Patayan People. Around 1700 A.D. the Utes (Anasazi descendants), Shoshonis and Hakalays (Hualapais) lived and traveled through the Grand Wash Joshua Forest area. They established the Old Ute Trail, which was also known as part of the Spanish Trail, which ran west from southern Colorado across the north rim of the Grand Canyon. The trail turned south, crossing the Colorado River at the Grapevine Wash Cliffs known by the Native Americans as Stones Crossings in present day Mohave County, Arizona. They used the natural springs south of the Colorado River along the Grapevine Wash and the Joshua Tree Forest to reach the southern plateau of the Grand Canyon. The largest of these springs, nestled at the 4000-foot level on the edge of the Joshua Tree Forest was called Tinakah by the natives, later named Grass Springs by explorers. Tinakah was a major rendezvous location for the native people and considered a very spiritual place. They called this their “Crying Ground” and held “Ghost Dances” here each year as part of the ceremony. The last known “Ghost Dance” was performed at this location in the 1887. Early in the 1800s mountain men explored the area along the Colorado River looking for fur-bearing animals. 1820s Jedediah Smith and other mountain men followed the Old Ute Trail into Utah and down the Virgin River to the junction of the Colorado River. They crossed to the southeastern side of the Colorado River and into the mountains along the southern plateau of Arizona. They probably passed through the Joshua Tree Forest in search of fur animals. In 1825 Smith’s hunting party was ambushed by local Native Americans while crossing the Colorado River southwest of the Joshua Tree Forest near current day Fort Mohave, California. 1827 Kit Carson led a contingent of US Cavalry under the command of Lieutenant Young North along the Colorado River following the Old Ute Trail. His route would have taken him through the Joshua Tree Forest and the Grapevine Wash in his exploration of a better route into Utah. In 1844 Kit Carson again led the US Cavalry under the direction of Captain John Fremont South through the Grapevine Wash and the Joshua Tree Forest area southwest into California. 1869 US Cavalry Captain Wheeler followed Kit Carson’s route north through the area to explore the lower Grand Canyon naming the ridge above the mouth of the canyon Wheeler Ridge. Wheeler’s party would have followed the Colorado River along the foothills of western Arizona in the area of the Joshua Tree Forest. 1850 -1885 Mormon travelers moved south around the Grand Canyon to do missionary work with the Native Americans in Arizona. They traveled across both the east (Lee’s Ferry) and west ends (Pearce Ferry) of the canyon. They named the trees in the area of the Grapevine Wash “Joshua Trees”, after the biblical prophet in the Book of Joshua because the trees up-turned spires reminded them of Joshua’s arms reaching up to God. They crossed the Colorado River near the western mouth of the Grand Canyon losing many animals and lives to the treacherous river. 1860 Jacob Hamblin and a group of men were sent by Brigham Young to establish a safe river crossing at the western end of the Grand Canyon. 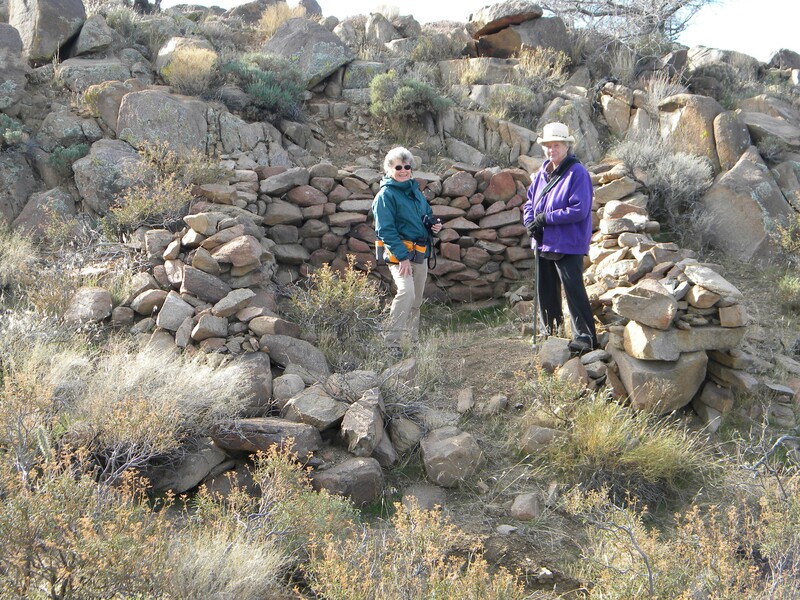 1863 Hamblin took supplies to build the first raft to cross the river at the Grapevine Wash. 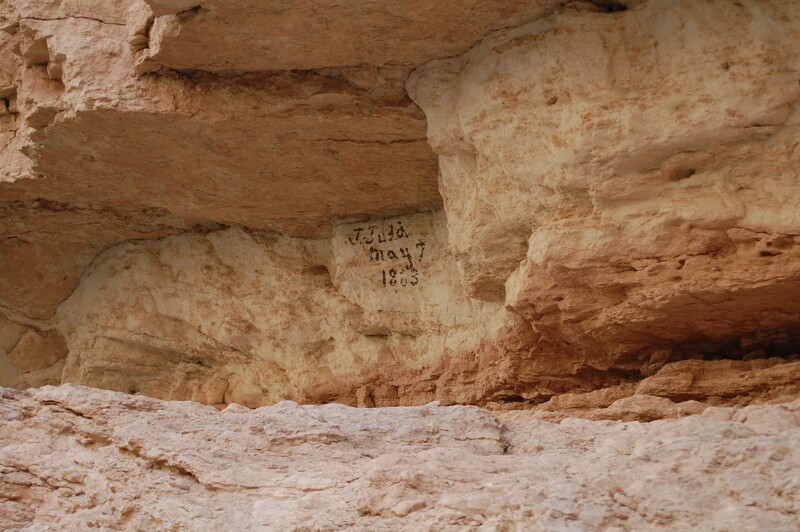 There are writings on the wall at the Grapevine Spring, just north of the Joshua Tree Forest, which document their presence. 1868 Erastus Snow laid out a regular wagon road from St. George to the Grand Wash Cliffs crossing the Colorado River at the mouth of the Grand Canyon. From there they traveled through the Grapevine Wash along the edge of the Joshua Tree Forest to Grass Springs (Tanakah) and on to present day Holbrook, Arizona. 1876 Harrison Pearce and his family were sent by the Mormon leaders to establish a permanent crossing known as Pearce Ferry to float people and livestock safely across the Colorado River. 1870 Wellington Starkey and his family homesteaded the Grass Springs area of the Joshua Forest, which became known as the Grass Springs Ranch. The Hualapai Indians still considered this sacred ground, which caused many conflicts over the years. 1875 G. G. (Bob) Patterson homesteaded an area just a few miles west of Grass Springs in the heart of the Joshua Forest around what became known as Patterson Wells. Patterson was more into mining and wanted the water for his livestock and mines. Patterson had mines in the mountain ridge between Gold Basin and Lost Basin. His ranch supplied food and water for the miners in the area. Also in the 1880’s a Pony Express Way Station was built at Patterson Spring, which picked up mail at Pearce Ferry. The U.S. Mail went through the Joshua Forest to the Railroad at Hackberry and Mineral Park Mining District. There were corrals and a saloon at the way station to service the miners in the area. 1880 Mormon settlers started mining in the Lost Basin area of the Joshua Tree Forest when the Native Americans told stories of Spanish explorers taking Indian slaves to dig for gold. 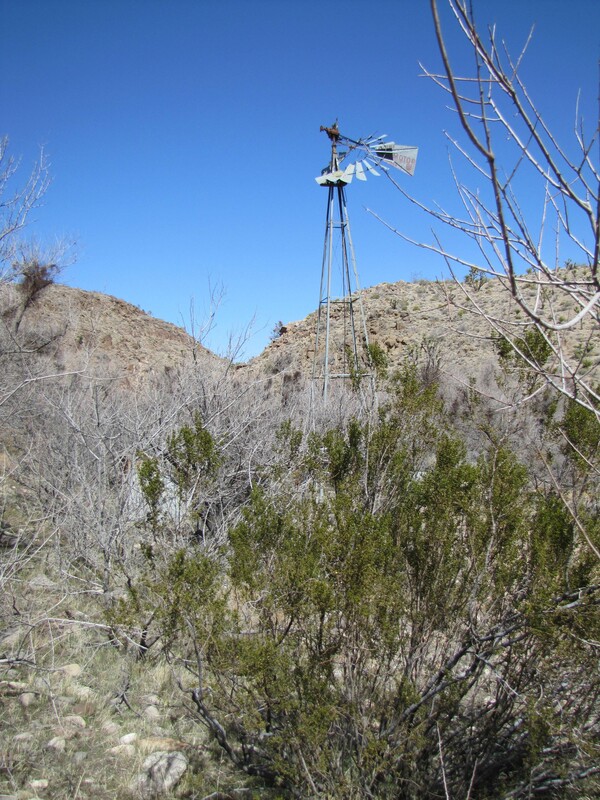 1883 Quarts Mill was built above the Grass Springs Ranch using an “Arrastra” to crush ore from the local mines. 1885 They created the Lost Basin Mining District on the western edge of the Joshua Tree Forest, which produced gold and silver. 1908 George Taplin (Tap) Duncan bought Grass Springs Ranch and renamed it the Diamond Bar Ranch, which stayed in the family until 1950. The ranch became the largest cattle ranch in Mohave County with 145,000 acres of leased BLM open range. Louis Lamour (author of western novels) stayed at the ranch and wrote a number of episodes using material supplied by the cowboys working at the ranch. 1950 Jim Smith purchased the Diamond Bar Ranch, calling it the Smith Ranch but the old name stuck forever. In April of 1930, the public lands within a four-township area of Grapevine Mesa were included within a National Monument withdrawal under executive order. The abundance of privately owned lands interspersed within the public lands, apparently was effective in foreclosing progress toward actual Monument designation, at a time when National Park Service land acquisition funds were low. 1950 Land development in the Joshua Forest was started by Revcor Engineering. They built roads to subdivide the private land originally granted to the Union Pacific Railroad. 1960 Unit 1 of the Meadview Township was started and housing lots were defined. Water was hauled from the “Lucky Seven Corral and Windmill” in the Grapevine Wash on the eastern edge of the Joshua Forest. The Mead City Township was started 10 miles south and 1000 feet higher in the Joshua Tree Forest at the same time frame. 1966 The Bureau of Land Management studied the Joshua Tree Forest. In 1967 as a result of the study, five sections (3200 acres) of public lands containing the very best stands of Joshua Trees, were classified as a National Natural Landmark. The National Natural Landmark designation carries no protections against possible adverse uses and the Bureau of Land Management suggested more protection from development was needed. 1979 The Kingman Resource Area Office of the Bureau of Land Management was directed to initiate another study of the Joshua Trees. The goal was to evaluate the current condition of the resources of the Grapevine Mesa Joshua Tree National Natural Landmark (NNL). They were to look at the effectiveness of current protection, and then set recommendations on how to better protect the area for the future. Ultimately the BLM recommended the Joshua Tree Forest be classified as an “Area of Critical Environmental Concern” (ACEC). 1980 Kingman, Arizona office of BLM initiated and successfully carried out numerous very large and complex land exchanges. These land swaps resulted in BLMs recommendation that the Joshua Tree Forest be classified as “Area of Critical Environmental Concern”. Maps were drawn up showing an enlarged boundary for the ACEC. 1986 Mohave County paved the last section of Pierce Ferry Road (County misspelled the name) to the Lake Mead Recreation Area boundary at Meadview, Arizona. This provided paved public access to Lake Mead and the western end of the Grand Canyon from Arizona highway 93 and parts west. This paved road runs through the National Natural Landmark. 1993 The Joshua Tree Forest and the associated Grand Wash Cliffs, covering 44,228 acres were classified as Area of Critical Environmental Concern. The Bureau’s Planning System adopted it administratively but no additional protective measures were defined. BLM has no authority to protect this area should the need arise to head off threats to the biological or scenic integrity of this area. 2001 The Diamond Bar Ranch was purchased by investors and turned into a dude ranch and tourist attraction. Tourists from California and Nevada travel through the Joshua Forest by the hundreds every day to view the Grand Canyon from the Hualapai Indian Reservation on the south rim.